International Journal of Research in Health Sciences,2014,2,1,274-281. 1-Associate Professor, 2-Post Graduate, 3-Professor and Head of Microbiology, Dept. of Microbiology, Chettinad Hospital and Research Institute, Kelambakkam, Chennai, Tamilnadu, INDIA. Background: Biofilms are a great threat to invasive devices causing slow persistent infections. Biofilms interfere in antibiotic therapy, undergo gene transformation to become highly virulent, develop quorum sensing and protect bacteria from host immunity. Objectives: 1. To isolate and identify the bacteria from invasive devices and to study their antibiotic susceptibility pattern. 2. Phenotypic detection of biofilm production of the bacteria by three different methods. Materials and Methods: A total of 229 samples like peripheral venous catheter tips, urine from Foley’s catheter, central venous catheter tips and endotracheal tube aspirates were collected from January 2011 to December 2011 and processed. Organisms were isolated and antimicrobial susceptibility was done as per CLSI guidelines. 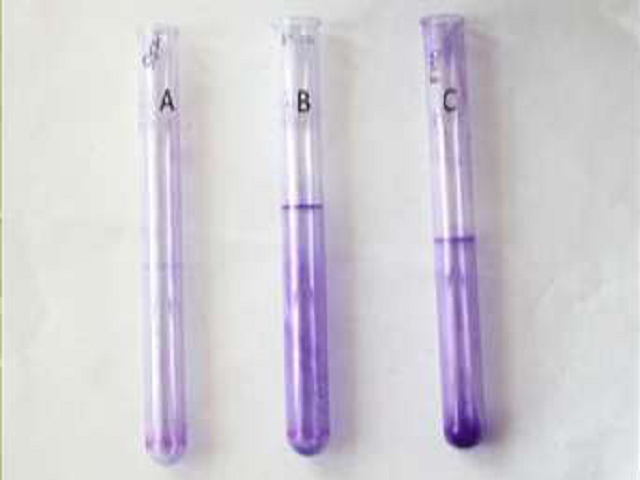 Biofilm detection was done by the three different methods a) Tube method by Christensen in 1982 b) Congo red agar method by Freeman in 1989 c) Tissue culture plate method by Christensen, 1985. Results: A total of 55 bacterial isolates were obtained from 229 samples. Out of 55 bacterial isolates, 4(7%) were positive by all three methods. Methicillin resistant Staphylococcus aureus (10%) and 10% extended spectrum betalactamase producing Klebsiella species produced biofilms, where as sensitive strains did not produce. Conclusion: Routine and advanced studies of the biofilm production will help in making better usage of the invasive devices without any critical complications. Tube method A. No visible film. B & C Visible film lining the wall and bottom of tube.